In 1986 when siblings Gilbert and Maguy le Coze arrived from France and opened a seafood restaurant in midtown Manhattan I rejoiced, especially after it became the talk of the town. Eight years later chef Gilbert died of a heart attack. Gourmets and Francophiles like me wept. Fortunately Maguy managed to entice talented Eric Ripert to take over her kitchen. I had not been to Le Bernardin in decades, but I am happy to report that lunch there surpassed my expectations. As a matter of fact I had not eaten such excellent and refined good food since I fulfilled another life-long desire of eating at the Taillevent in Paris some ten months earlier. The restaurant deserves its status among the world’s fifty best. The menu at the Bernardin is imaginative and super-sophisticated. Though everything is “fishy,” many items derive their names from classic meat dishes. We started with an amuse-bouche of meat-tasting rillette de saumon. Traditional rillette is a paté made from shredded pork. Ripert’s version consists of an equal mix of cooked and raw salmon. Warm Scallop “Carpaccio” Snowpeas and Shiitake Lime-Shiso Broth followed. Scallops are my favorite seafood, and ordering them in a restaurant is usually a mistake because they are over-aged, over-soaked, over-cooked, or all three. Not here. The slivers of scallops, enhanced by bits of shitake mushrooms and snow peas, were barely cooked and spiced to perfection. They had an ideal consistency and tasted of the ocean. When will American restaurants serve scallops with their roe as they do in Europe? However, I had a tough time deciding on the main course, but finally opted for the Poached halibut: “Black Truffle Pot-au-Feu.” It came with two sauces, the first a simple fish broth, the second a velouté of mushrooms. My “server” (the term “waiter” is no longer P.C.) managed to pour one sauce around the halibut, the other on top of it, and they maintained their individuality. My husband’s Layers of Thinly Pounded Yellowfin Tuna; Foie Gras and Toasted baguette, Chives, and Extra Virgin Olive Oil was perhaps the best food on the menu. I still marvel at the thinness of the toast and the complexity of its flavor. The Poached Skate and Warm Oysters Brussels Sprouts-Bacon Mignonette Dijon Mustard Sherry Emulsion was also extraordinary, though neither of us could have vouched whether the dishes contained all the listed ingredients. Dessert too was delicious, but more standard. Since this was our anniversary we got an extra serving of a chocolate mousse, and vanilla ice cream. The restaurant, decorated in subdued shades of gray, silver, and brown is both spectacular and restrained. A large part of the space is paneled in honey-colored wood. A mural depicting a moderately agitated ocean dominated the dining room. Another wall is covered with molded strips of aluminum suggestive of a waterfall. On our visit calla lilies filled huge glass vases and a single white spider mum—a stand-in for a water lily—stood on each table. It was a wonderful lunch and I can’t wait to go back. 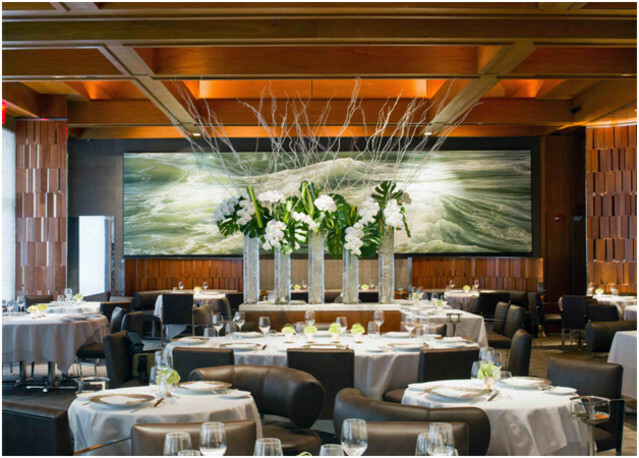 This entry was posted in Uncategorized and tagged anniversary lunch, Eric Ripert, fish, Gilbert le Coze, le bernardin, lunch, Maguy le Coze, new york, restaurants, rillette de saumon, scallops, seafood. Bookmark the permalink.